As they announced their 2017 financial results today, Safaricom also unveiled 1Tap – the next step of innovation to drive increased financial inclusion in Keyna. M-Pesa is ten years old and CEO Bob Collymore said that Safaricom was launching “Mpesa 1 tap” which would reduce the number of steps to complete an M-Pesa transaction, currently about 8 steps on SMS and USSD, to just 1 step. At the result announcement, the Safaricom CFO Sateesh Kamath said that while 75% of M-Pesa revenue was from traditional person to person transfers, 25% was new from new business like “Lipa na Mpesa” (pay with M-pesa) payments. Buy Goods is free for customers, except at petrol stations which levy an additional charge, and just over a month ago, Safaricom announced a 50% tariff reduction for all Lipa Na M-PESA Buy Goods merchant fees – to 0.5% of the transaction amount. These were also was capped to Kshs 200 for any payments over Kshs 40,000 (~$400) while payments to merchants below Kshs 200 were made free. Lipa Na M-pesa is used by over 50,000 merchants and Safaricom plans to enable more kiosks, boda-bodas, newspaper vendors and other merchants who are in the informal sector where 80% of Kenyan work to receive such vital business payments at no cost. Merchants can also get instant payments into their bank accounts at any of 23 partner banks (of the 40 banks in Kenya) from a Lipa Na M-pesa menu in their phones in just a few seconds – and this is useful as many of the merchants don’t have time to go to the bank to deposit cash. With 1 Tap, all a customer needs to do is tap their cards on the mobile POS machines and then enter their secret M-Pesa PIN to confirm the transaction. 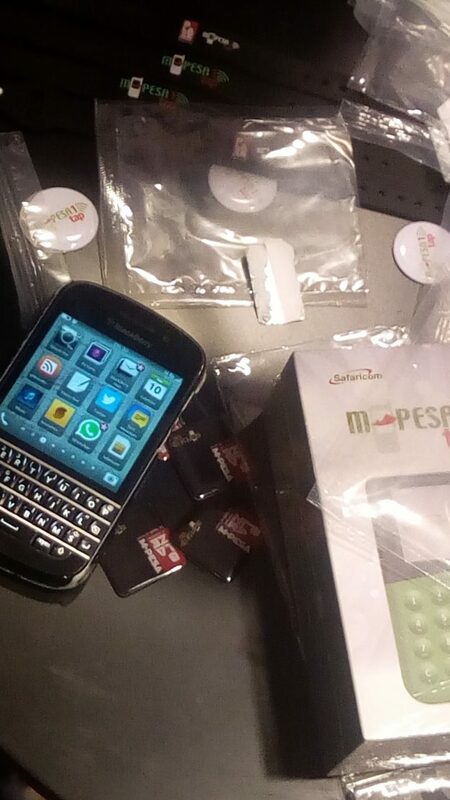 Pilot testing for Mpesa 1 Tap has been ongoing in Nakuru where the service now has 13,000 customers and 900 merchants. Kenyans briefly got to see what NFC could work with the Beba Pay service a few years ago, with payments in public service vehicles. EDIT October 3 Following successful trials over the last four months in Nakuru, Safaricom announced the availability of M-PESA 1Tap in Nairobi, Mombasa, Kisumu, Eldoret and Nyeri. ..M-PESA 1Tap will be available to all Lipa Na M-PESA merchants and customers and aims to make it faster and easier to make and receive cashless payments. M-PESA 1Tap will be progressively rolled out to leading supermarkets, petrol stations, and restaurants…Some of the merchants where customers can now make payments with M-PESA 1Tap include Shell, Naivas, Choppies, KenolKobil, KFC, Oil Libya, Total and QuickMart. The merchant solution currently involves an NFC based reader integrated to merchants Lipa Na M-PESA tills. This entry was posted in kenya communications, Kenya economic growth, M-Pesa, Safaricom, SME solutions and tagged 1Tap, M-Pesa, NFC on May 10, 2017 by bankelele. M-Pesa is officially over five years old and is celebrated as the greatest use of mobile money in the world with about 15 million users. But the question of who created M-Pesa has never been resolved..until now. On Sunday, there was a day-long outage of M-Pesa which Safaricom attributed to a power outage on a Vodafone server in Germany and this started quite a bit of discussion on twitter about why the service is run from Germany and how authentically Kenyan M-Pesa really is. I’ve been in touch with Paul Makin before and so I invited him to join the conversation by tagging him and he went on to engage by giving answers to questions from twitter pals like @MediaMK @IddSalim @TerryAnneChebet and @Coldtusker who were genuinely interested and drove the conversation. No-one GIVES me authority. As the original architect, I TAKE it. Original team was Nick Hughes and me. I came up with concept and architecture. Nick forced it through the business. Susie Lonie joined after about 6 months. This was all back in 2004. Took 3 years to get to launch. Susie made sure it worked on the ground. She went around forcing people to work together. We chose Sagentia to do the build. They did a good job. M-Pesa was a good team in those days.. didn’t say that. The TEAM chose Sagentia. So I didn’t build it, the team did. It was my concept and original design, though. DFID money said KE and/or TZ. We couldn’t find the right partners in TZ.. plus we liked entrepreneurial culture in KE. People were keen to work with us. It was matched funding. DFID money only helped (the) pilot. VF money funded the live service. VF invested a lot. VF own all the IP. They paid for it. SF extremely helpful, and KE a good environment for innovation. People willing to try new things and try to make business! No, but they were a good partner network. Very supportive. And you can’t do proper security without being in the network! I get annoyed when I see people who joined months/years l8r claiming they designed it! We talked as a team in a Nairobi bar. Came up with it, asked the barman (edit). He liked it, so it stuck. VF didn’t like the name. Not corporate enough. But Nick fought for it, and won. There were the agents, who worked very hard. Without agents, M-Pesa is nothing. Lots of people came out of the woodwork, trying to claim it. Not good. …Vodafone won £1 million DFID (UK) award for deepening financial penetration for the unbanked, which they also had to match financially – and they were to develop a system for the disbursement and repayment of microfinance loans. They tested in Thika for 6 months and realized that it had more potential as a money transfer tool, and they launched M-pesa in March 2007… also that big multinational banks who had shut down rural branches abandoning their customer opposed m-pesa and fought in government & parliament and would have succeeded till he persuaded acting finance minister John Michuki to green light M-pesa. Different groups of Kenyans who say they invented M-Pesa. The agent network or the branding as the reason for its success. This entry was posted in Kenya ICT, M-Pesa, Safaricom and tagged M-Pesa on October 29, 2012 by bankelele.